Join us at the 2019 Offshore Technology Conference, May 6 to 9, 2019 (Houston) - Kalsi Engineering, Inc.
Kalsi Engineering invites you to stop by and visit with us at booth 4500 during the 2019 Offshore Technology Conference (OTC). The 2019 show is May 6 to 9 at the NRG Center in Houston, Texas. You can click here to register for a complimentary multi-day pass, courtesy of Kalsi Engineering. Rotary Seals – Stop by our booth to meet the engineers who are at the forefront of polymeric high-pressure rotary sealing technology. Learn directly from them about our latest advances in high-pressure rotary shaft seals, and how to implement them in your rotary shaft seal assembly. While you’re there, the time to examine our extra wide seals for Rotary Control Devices (RCDs), so you can understand why this robust elastomeric seal is so capable as a high-pressure RCD seal. Have a look at the data from the fixture we developed to test full-size RCD seals in high pressure conditions, and then learn about our plastic lined seals, which have even more pressure capacity than the extra wide elastomeric seals. Also have a look a pair of used 10.50” seals that endured 200 hours of operation at 100 rpm and 2,300 psi, while mounted in conventional non-floating seal carriers. Learn about our KLS® and BRDP seals, which were developed for lower cost rotary heads that do not incorporate lubricant overpressure systems. Also learn about our continuing advances in hardware implementations that enhance rotary seal performance in high pressure conditions by dramatically reducing extrusion gap clearance. Improvements include composite construction that reduces pressure and temperature-related dimensional changes, geometry innovations that provide improved torsional stability and accommodate smaller extrusion gaps, and enhancements to the force-balancing seals, including higher pressure capacity and reduced friction. Learn how these advances can improve seal performance in various types of equipment, such as RCDs, high pressure swivels, cementing heads, and washpipe assemblies. Visit us at OTC to see how our high-pressure rotary shaft seal technology can benefit your equipment. Jarring Software – JarPro™ is a general-purpose jarring analysis program used by leading jar manufacturers, oil companies, and equipment/service companies. It helps to reduce the cost of freeing stuck drillstring by facilitating selection and placement of jars and accelerators, and provides detailed time histories of jarring impact. The software is also capable of analyzing the effects of multiple jars. It has an intuitive user interface, and can be customized to fit the needs of your organization, such as including your equipment in pulldown menus. Consulting Engineering – In addition to our jarring software and rotary seal product line, Kalsi Engineering offers a wide variety of consulting engineering services, including the design of testing apparatus for the oilfield industry. Our staff has an outstanding background, and an accomplished record of practical mechanical engineering solutions for a variety of mechanical equipment used in the oilfield and petrochemical industries. Examples of equipment we have worked with include downhole tools, wellhead and drilling equipment, pressure vessels and piping components, reactor vessels, heat exchangers, valves, actuators, and pumps. We have two laboratories dedicated to mechanical, structural, and environmental testing. We also offer an indoor flow loop testing facility. 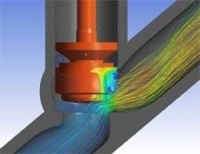 We have special expertise in the area of validated, state-of-the-art FEA and CFD solutions to some of the most complex problems involving fluid/structure/thermal interactions. Our two super computers can efficiently handle very large scale non-linear problems exceeding 100 million degrees of freedom. To find out more about Kalsi Engineering, visit our website or stop by and see us at OTC booth 4500. We appreciate your business, and look forward to seeing you at the show. These CFD predictions for a Y-Pattern Globe Valve illustrate the pressure contours on the plug and streamlines through the valve.